Hermann Hesse ([ˈhɛr.man ˈhɛ̞.sɘ]) (July 2, 1877 – August 9, 1962) was a Nobel Prize–winning German-Swiss novelist and poet. Hesse gained a wide readership for his lyrical explorations of spirituality and psychology in a time when other modernists were describing the dread, alienation, and absurdity of modern industrial society. As a young man, Hesse was an eager student of nineteenth century Romanticism, admitting his immense debt to major Romantic novelists and poets such as Goethe and Hölderlin. Hesse's interests in self-understanding and spiritual realization were explored in the genre-expanding Steppenwolf, which fused dreamlike awareness and Jungian psychology with realism. The novel was praised by Joseph Cardinal Ratzinger, later Pope Benedict XVI, because it "exposes the problem of modernity's isolated and self-isolating man." Hesse's interest in Eastern religion and Chinese philosophy, following a journey to India, Sri Lanka, and Indonesia, led to the publication of Siddhartha, a fictional account of a young man's journey toward enlightenment during the time of Buddha, and one of his best-loved novels. Although Hesse collaborated closely with a number of contemporary German writers, among them Thomas Mann, Bertolt Brecht, and Romain Rolland, his prose is neither as dense nor experimental as many modernists. In fact, Hesse's novels are often used by students of the German language because of their simple elegance and accessible style (although his final novel, The Glass Bead Game, is notoriously challenging within his oeuvre). Hesse was concerned with the dominant themes of modernism—the loss of cultural consensus, the growing anomie of the individual, the spiritual void of post-Christian Europe—yet believed that an inner quest and the resources of Eastern spirituality provided an alternative to existential despair on one hand and militant nationalism on the other. Long an advocate of the individual's private quest for self-knowledge, Hesse despised the growing mass movement of German nationalism and the rise of National Socialism. He came under suspicion and his works were censored during the Third Reich, but he survived the war, winning the Nobel Prize for Literature in 1946. Hermann Hesse was born on July 2, 1877, in the Black Forest town of Calw in Württemberg, Germany, to a Christian missionary family. Both of his parents served with a Basel Mission to India, where Hesse's mother, Marie Gundert, was born in 1842. Hesse's father, Johannes Hesse, was born in 1847, in Estonia, the son of a doctor. The Hesse family had lived in Calw since 1873, where they operated a missionary publishing house under the direction of Hesse's maternal grandfather, Hermann Gundert. Hermann Hesse spent his first years of life surrounded by the spirit of Swabian piety. 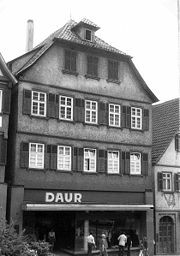 In 1881, the family moved to Basel, Switzerland for five years, then returned to Calw. After successful attendance at the Latin School in Göppingen, Hesse began to attend the Evangelical Theological Seminary in Maulbronn in 1891. Here in March 1892, Hesse showed his rebellious character: He fled from the Seminary and was found in a field a day later, cowering. During this time, Hesse began a journey through various institutions and schools, experiencing intense conflicts with his parents. It was also at about this time that his bipolar disorder began to affect him; he mentioned suicidal thoughts in a letter dated March 20, 1892. In May, after an attempt at suicide, he spent time at an institution in Bad Boll under the care of theologian and minister, Christoph Friedrich Blumhardt. Later he was placed in a mental institution in Stetten im Remstal, and then a boys' institution in Basel. Afterwards, he began a bookshop apprenticeship in Esslingen am Neckar, but left three days later. In the early summer of 1894, he began a 14-month mechanic apprenticeship at a clock tower factory in Calw. The monotony of soldering and filing work made him resolve to turn himself toward more spiritual activities. In October 1895, he was ready to begin wholeheartedly a new apprenticeship with a bookseller in Tübingen. He would return to this experience from his youth in his novel, Beneath the Wheel. On October 17, 1895, Hesse began working in the bookshop Heckenhauer in Tübingen, which had a collection specializing in theology, philology, and law. Hesse's assignment there consisted of organizing, packing, and archiving the books. After the end of each 12-hour workday, Hesse pursued his own work further, spending his long, free Sundays with books rather than with friends. Hesse studied theological writings, and later Goethe, Lessing, Schiller, and several texts on Greek mythology. In 1896, his poem "Madonna" appeared in a Viennese periodical. In 1898, Hesse had a respectable income that enabled his financial independence from his parents. During this time, he concentrated on the works of the German Romantics, including much of the work from Clemens Brentano, Joseph Freiherr von Eichendorff, Friedrich Holderlin, and Novalis. In letters to his parents, he expressed a belief that "the morality of artists [has been] replaced by aesthetics." In the fall, Hesse released his first small volume of poetry, Romantic Songs and in the summer of 1899, a collection of prose, entitled One Hour After Midnight. Both works were spectacular failures. In two years, only 54 of the 600 printed copies of Romantic Songs were sold, and One Hour After Midnight received only one printing and sold sluggishly. Nevertheless, the Leipzig publisher, Eugen Diederichs, was convinced of the literary quality of the work and from the beginning regarded the publications more as encouragement of a young author than as profitable business. Beginning in the fall of 1899, Hesse worked in a distinguished antique book shop in Basel. There his family contacts with local intellectuals opened him to a spiritual-artistic environment, rich with stimuli for his pursuits. At the same time, Basel offered the solitary Hesse many opportunities for withdrawal into a private life of artistic self-exploration through journeys and wanderings. 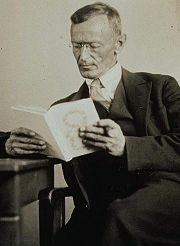 In 1900, Hesse was exempted from compulsory military service due to an eye condition, which, along with nerve disorders and persistent headaches, affected him his entire life. In 1901, Hesse undertook the fulfillment of a grand dream, traveling for the first time to Italy. In the same year, Hesse changed jobs and began working at the antiquarian Wattenwyl, in Basel. Hesse had more opportunities to release poems and small literary texts to journals. These publications now provided honoraria. Shortly, the publisher Samuel Fischer became interested in Hesse, and with the novel Peter Camenzind, which appeared first as a pre-publication in 1903 and then as a regular printing by Fischer in 1904, came his breakthrough. From then on, Hesse could live as a free author. His literary fame secure, Hesse married Maria Bernoulli in 1904, settled down with her in Gaienhofen on Lake Constance, beginning a family, eventually having three sons. In Gaienhofen, he wrote his second novel Beneath the Wheel, which appeared in 1906. In the following period he composed primarily short stories and poems. His next novel, Gertrude, proved very difficult for Hesse to write—after struggling for four years, he published it in 1910, later describing it as "a miscarriage." Gaienhofen was also the place where Hesse's interest in Buddhism was reignited. Since writing a letter in 1895, entitled "Nirwana," Hesse had ceased alluding to Buddhism in any of his writings. However, in 1904, when Arthur Schopenhauer's philosophical ideas started receiving attention again, Hesse discovered theosophy, and through it, he rediscovered a love of Buddhist teaching. During this time, there also was increased dissonance between Hesse and Maria, and in 1911, Hesse, alone, left for a long trip to Ceylon and Indonesia. Any spiritual or religious inspiration he hoped to discover did not find him, but the journey made a strong impression on his literary work. Following Hesse's return, the family moved to Bern in 1912, but the change of environment could not solve the marriage problems, as he himself confessed in his novel, Rosshalde, from 1914. At the outbreak of the First World War in 1914, Hesse registered himself as a volunteer with the German government, saying that he could not sit inactively by a warm fireplace while other young authors were dying on the front. He was found unfit for combat duty, but was assigned to service involving the care of war prisoners. On November 3, 1914, in the Neuen Züricher Zeitung, Hesse's essay O Friends, Not These Tones (O Freunde, nicht diese Töne) appeared, in which he appealed to German intellectuals not to fall for nationalism. What followed from this, Hesse later indicated, was a great turning point in his life: For the first time he found himself in the middle of a serious political conflict, attacked by the German press, the recipient of hate mail, and distanced from old friends. This public controversy was not yet resolved when a series of personal crises befell Hesse in 1916: His father died in March, and shortly afterwards his son Martin fell seriously ill, followed almost immediately by his wife Maria collapsing into a schizophrenic fit for which she was institutionalized. Overwhelmed by these events Hesse was forced to leave his military service and begin receiving psychotherapy. This began a long preoccupation with psychoanalysis, through which he came to know Dr. Carl Jung personally. 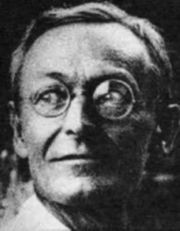 Over a three-week period during this time in his life, Hesse penned his novel Demian, which dealt rather explicitly with psychoanalytical themes, and which would be published following the armistice in 1919, rocketing Hesse once again into national acclaim. When Hesse returned to civilian life in 1919, his marriage was shattered. His wife suffered from a severe outbreak of psychosis, and even after her recovery, Hesse saw no possible future with her. Their home in Bern was divided, and Hesse resettled alone in the middle of April, in Ticino, where he occupied a small farm house near Minusio bei Locarno, and later lived, from April 25 until May 11, in Sorengo. On May 11, he moved to the town Montagnola and rented four small rooms in a strange, castle-like building, the Casa Camuzzi. Here, he explored his writing projects further; he began to paint, an activity which is reflected in his next major story Klingsor's Last Summer, published in 1920. In 1922, Hesse's novel Siddhartha appeared, which showed his love for Indian culture and Buddhist philosophy. In 1924, Hesse married the singer, Ruth Wenger, daughter of the Swiss writer, Lisa Wenger, and aunt of Meret Oppenheim. This marriage never attained any true stability, however. In this year, Hesse received Swiss citizenship. His next major works, Kurgast from 1925, and The Nuremberg Trip from 1927, were autobiographical narratives with ironic undertones, and which foreshadow Hesse's next novel, Steppenwolf, published in 1927. In the year of his fiftieth birthday, the first biography of Hesse appeared, written by his friend Hugo Ball. Shortly after his new successful novel, Hesse married a Jewish woman, Ninon Dolbin Ausländer. As far as can be ascertained, Ninon was the love of Hesse's life, and his changed attitudes towards romantic relationships were reflected in his next novel, Narcissus and Goldmund, (1930) which dealt quite explicitly with its protagonist attempting to find spiritual stability by finding the perfect companion. In 1931, Hesse began planning what would become his last major work, The Glass Bead Game. In 1932, as a preliminary study, he released the novella, Journey to the East. Hesse observed the rise to power of Nazism in Germany with great concern. In 1933, Bertolt Brecht and Thomas Mann went into exile, and in both cases, were aided by Hesse. In this way, Hesse attempted to work against Hitler's suppression of art and literature that protested Nazi ideology. Since the 1910s, Hesse had published book reviews in the German press, and now he spoke publicly in support of Jewish artists and others pursued by the Nazis. However, when he wrote for the Frankfurter Zeitung, he was accused of supporting the Nazis, whom Hesse never openly opposed during the pre-war years. From the end of the 1930s, German journals stopped publishing Hesse's work, and his work was eventually banned. As spiritual refuge from these political conflicts and later from the horror of the Second World War, he worked on the novel The Glass Bead Game, which was printed in 1943, in Switzerland. For this work among his others, he was awarded the Nobel Prize in Literature in 1946. After the War, Hesse's productivity declined. He wrote short stories and poems, but he would never write a novel again. He occupied himself with the steady stream of letters he received as a result of his Nobel Prize, as a new generation of German readers explored his work. He died on August 9, 1962, and was buried in the cemetery at San Abbondio in Montagnola. Siddhartha, published in 1922, while well-received in Hesse's time, but enjoyed nothing like the popularity it has acquired since its first publication in English translation in 1951. The densely allegorical story of an Indian man named Siddhartha—the name of The Buddha before his enligtenment—which closely parallels and expands traditional legends of The Buddha's early life, has become perhaps Hesse's most well-known and widely-read novel. The novel has become famous for a number of reasons. It was written in a simple yet powerful and lyrical style, and it is easily one of the most readily readable works of literature written in the early twentieth century. Written after Hesse's own voyages to India and the East, and drawing on his family's extensive knowledge of Indian and Buddhist culture, the work is remarkable for making a number of profound philosophical and spiritual questions readily accessible to a broad audience. In the original German, the novel is also renowned by writers for its beautifully repetitious, almost hypnotic language. When Siddhartha, the gifted and popular son of a Brahmin, gets weary of the formal and strict ways of Hindu prayer and sacrifice, he leaves home with Govinda, his admiring friend. They join a group of samanas—ascetic, wandering monks— and live in the wilderness, fasting and trying to find their "inner selves." After three years of this life, the boys hear about The Buddha and leave the samanas to listen to his teachings. Govinda joins the Buddhist monks. Siddhartha, however, is convinced that only personal experience and not external teachings can lead to true knowledge and salvation. From there he decides to "find himself" and re-enters the world of ordinary life. He wanders to the house of a rich courtesan, Kamala, who begins to take a liking to the young man. She tells him that in order for her to teach him the art of love, he must find a job and return with gifts. Siddhartha becomes assistant to a merchant, Kamaswami, and turns out to be quite successful as a merchant himself. At first Siddhartha remains detached and rather amused about how seriously the ordinary people live; but gradually, he immerses himself into a life of gambling and greed. Eventually becoming unhappy and tired of playing life like an empty game, Siddhartha leaves Kamala and Kamaswami to wander yet again. After a spell of depression, Siddhartha feels the joy of new-found freedom. At a river, he meets for the second time in his life a humble ferryman, Vasudeva, whose off-hand wisdom and good-nature had deeply impressed Siddhartha in his youth; this time, he decides to stay with him. The two share a deep love for the river and work together as ferrymen. Meanwhile, Kamala, unbeknownst to Siddhartha, had given birth to his son. When she and her son go on a pilgrimage to see the Buddha, Kamala is bitten by a snake near the river. Before she dies, she recognizes Siddhartha and tells him the boy is his son. Siddhartha takes care of his discontented son and tries to instill appreciation of the simple life and virtue into him. Ultimately, he fails and his son leaves the river to return to the city and live his own life. It is after his son leaves him that Siddhartha recognizes the essence of all wisdom is the oneness of all. Together with Vasudeva, he listens to the many voices of the river which come to represent the oneness of all the people, plants, and animals. The noise of the mingled voices of the river melds into the sacred syllable, Om. Meditating one day by the side of the river, Siddhartha attains enlightenment. Many years later, Govinda comes by the river, still a practicing Buddhist monk and still searching for certainty in his own life. When he asks the ferryman (whom he does not at first recognize as his childhood friend) about what has brought him such peace, Siddhartha replies that "too much searching can get in the way of finding." Everything deserves love, Siddhartha tells him, except words: True wisdom cannot be conveyed with words or thoughts. At Siddhartha's request, Govinda kisses him on the forehead, and the novel closes with a vision Govinda sees in Siddhartha's face, seeing not the face of his friend, but a sea of people, animals, plants, and all the objects of the world in perfect confluence and harmony. In doing this, Govinda achieves enlightenment, just as Siddhartha had before him, leaving the two friends at peace with the world. Written in a period of great depression and spiritual doubt in Hesse's life (he had just recently emerged from psychoanalysis counseling for the disintegration of his marriage, the death of his father, and the critical illness of his young son), Steppenwolf marks the integration of another system of ideology into Hesse's thought. This time, rather than incorporating Buddhism as the central theme, Hesse borrows rather heavily from psychoanalysis, and particularly toys with the notion of the conflict between the conscious and unconscious mind. It is now acclaimed as one of Hesse's unparalleled masterpieces, often ranked second only to Das Glasperlenspiel as his greatest artistic achievement. The book is presented as a manuscript written by its protagonist, a middle-aged man named Harry Haller, which he leaves to a chance acquaintance who decides to print it, adding a short preface of his own. The title of this "real" book-in-the-book is Harry Haller's Records (For Madmen Only). As Harry's story begins, he is beset with self-reflections on his ill-suited disposition for the world of regular people. In his aimless wanderings about the city, he encounters a person carrying an advertisement for a "magic theater" who also gives him a small book, Treatise on the Steppenwolf. This treatise is cited in full in the novel's text (another level of the novel's nested narratives). The pamphlet addresses Harry by name and seems to describe him perfectly, as a man of two natures: One "high" and spiritual; the other "low" and animal—the "steppenwolf." The treatise describes the two sides of Harry's personality, entangled in an unresolvable struggle, never content to coexist. The next day, Harry meets a former friend and is invited to his home. However, Harry ends up offending him by criticizing his wife`s picture of Goethe, a figure he later dreams about. Trying to postpone returning home to the razor he plans to kill himself with, Harry chances upon Hermine, a young woman in a dance hall, who talks to him at length, promising a subsequent meeting, giving him a reason to start "learning to live." Over several weeks Hermine finds Harry a lover, teaches him to dance, and introduces him to a saxophonist named Pablo. Harry almost begins to be content with his life, when events take a very unexpected turn. Das Glasperlenspiel (The Glass Bead Game) would prove to be Hesse's last major work. He began working on the book in 1931, and soon realized that he was touching upon themes that might take a lifetime to fully work out; he finally published the novel in 1943. The German title is translated alternately as The Glass Bead Game and Magister Ludi; The Glass Bead Game is a literal translation, while Magister Ludi is a Latin pun meaning "master of the game" and also the name of a prominent character in the book. The Glass Bead Game focuses on a monastic order of intellectuals in the fictional province of Castalia. The story takes place in the distant future and is recorded by a future historian. The current era is referred to only vaguely as an intellectually superficial and decadent period described as the "Age of the Feuilleton," a French term for novels and short stories published in serials. The book chronicles the life of Joseph Knecht, a resident of the fictional land of Castalia whose surname, significantly, translates as "knave" or "farmhand." Like many of Hesse's works, the polarity between mind and body, between man's higher and lower instincts, is at the heart of the work and forms the major conflict in Joseph's own life. The novel is of formidable length and daunting complexity, and far too difficult to summarize in a brief outline. However, two relationships in Knecth's life are of particular interest and form dominant arcs throughout the narrative. One is the relationship Knecht holds with a learned monk, Father Jacobus. In his introduction to Demian, Thomas Mann likens his own relationship to Hesse to the relationship of Knecht to Jacobus, going on to say that their knowledge of each other was not possible without a great extent of ceremony. Father Jacobus becomes a mentor figure for Knecht, however, like the relationship between Mann and Hesse, the two do not live harmoniously as teacher and student. The other major figure who appears in Knecht's life is Plinio Designori. If Knecht, who becomes increasingly philosophical as he grows older, represents asceticism and the life of the mind, then Designori acts as a voice for normality and the ordinary world. Knecht's attitude towards Designori varies between envy, open dialogue, and outright conflict. Together, Designori and Jacobus become allegorical figures for the two halves of Knecht's consciousness. At the center of Castalia's society, and at the center of the novel, lies the fictitious glass bead game that dominates the lives of all the major characters. The precise rules of the game are only alluded to, and must be so sophisticated that they are not easy to imagine. Essentially the game is an abstract synthesis of all arts and scholarship. It proceeds by players making deep connections between seemingly unrelated topics, bringing together disparate ideas the way one might knock together marbles on a billiard table. For example, a Bach concerto might be related to a mathematical formula, and from there connected to a painting by van Gogh, and then to a theorem of particle physics, and so on, without end. Essentially, the glass bead game represents a sort of intellectual sport, that has captivated Knecht's entire world. The glass bead game derives its name from the fact that it was originally played with tokens, perhaps analogous to those of an abacus or the game, Go. At the time that the novel takes place, the beads have become obsolete and the game is played only with abstractions and formulas. There is no direct source for what may have given Hesse the inspiration to invent the glass bead game, though there is some suggestion that it may have been borrowed from Leibniz, about the invention of a universal calculus—that is, an absolutely precise mathematical language that could describe everything in the universe. Castalia is an ethereal land devoted entirely to intellectual pursuits, and most especially the continued play of the glass bead game. Residents of Castalia ignore the troubles and sufferings of the world outside its borders. Knecht becomes a master of the glass bead game, ultimately acquiring the title of Magister Ludi—"master of the game"—only to begin to openly question its importance. Over time, it becomes clear that a major question that no one in Castalia has raised, and one that becomes increasingly troubling for Knecht, is whether the intellectually gifted have a right to withdraw from the problems of the world. Knecht ultimately concludes that Castalia—and its obsession with the pointless, endless glass bead game—is a grossly irresponsible country. He resigns his post as master of the game, entering the larger world so that, as he says, he can do something of value, and be of service to people. Hesse, however, ends the novel on a note of vexing irony, once again leaving the reader to decipher for themselves what to make of Knecht's story and the land of Castalia—only days after entering out into the real world, Knecht stumbles into a river and, not knowing what to do, drowns, having wasted his brilliance, accomplish nothing at all. Works by Hermann Hesse. Project Gutenberg. Hermann Hesse Page - in German and English, maintained by Professor Gunther Gottschalk. Community of the Journeyer to the Easy - in German and English. This page was last modified on 21 December 2017, at 15:27.